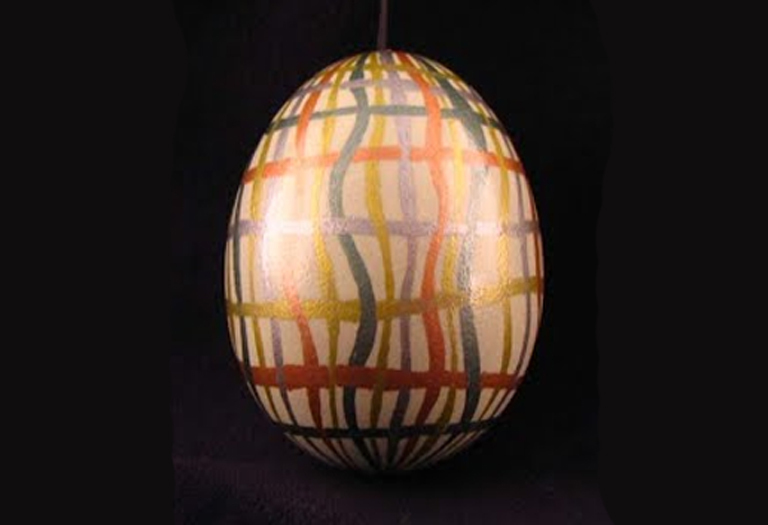 Unique Eggs by Ruth are real chicken, duck, or goose eggs that have been blown out, cleansed, sometimes dyed or painted with acrylics, sometimes left a natural white, brown, or green color, and decorated with freehand designs in India ink, paint markers, paints, or thread. Each egg is given five coats of clear varnish-like spray to preserve the design and strengthen the whole creation. Doodling and drawing have been Ruth’s hobbies since she outgrew coloring books. After receiving a bachelor’s degree in English Literature from the University of Chicago, she went to work as a secretary and began serious doodling again, using a drafting pen and colored pencils. Eventually she decided to try the technique on eggshells, though exactly what prompted this urge remains a mystery. Ruth’s egg creation was chosen as the “Wisconsin Egg 2008” for the White House Egg Gallery 2008; each year’s Gallery is included in the White House permanent collection. Ruth’s egg creations may be viewed at Unique-Eggs.com, at the shops noted on the website, or by appointment at her residence.